Was there definitely nothing wrong with [the] ex-ante level of claims? Now, this is uncomfortably close to one of the standard responses to criticism used by political scoundrels throughout public policy history: ‘So, you would have done nothing, huh?’ To which the answer is almost always: ‘No, I just wouldn’t have done what you did’. And my tweeted retort to Giles was indeed that there was “very little” wrong with the level of claims in mid-2011, when Dr Cable and then justice secretary Ken Clarke agreed to introduce hefty claimant fees, not least because claim/case numbers were at that time going down. However, as one of the good guys in life (and the Coalition government), Giles deserves a fuller response to his question than it is possible to give in one or two tweets. So I promised him this blog post. What a lucky chap he is. So, what was the ex-ante level of ET claims (or cases) in 2011? Well, the answer to that question is slightly complicated by the fact that there are two different types of ET case: (a) single claims/cases brought by individual workers; and (b) multiple claimant cases involving tens, hundreds or even thousands of workers, each with an identical (or very similar) claim against the same employer. For example, in 2012-13 – the last year before fees – there were 54,704 single claims/cases, and 6,104 multiple claimant cases (involving a total 136,837 claimants), brought against a total 60,808 employers (give or take some single claims brought against the same few recidivist employers). And, as a result, there are two alternative ways of measuring the ‘level of ET claims’. 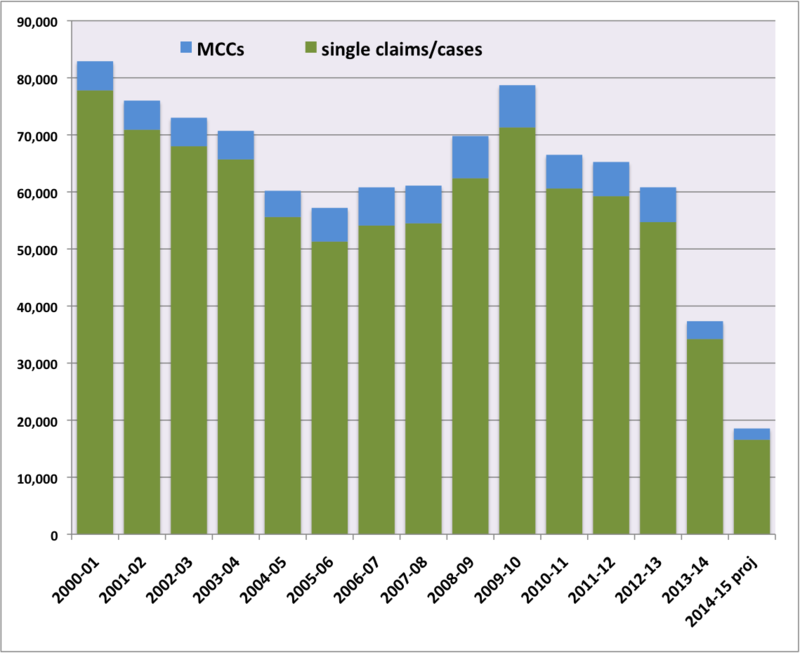 The second – and far more meaningful – way to measure the ‘level of ET claims’ is to total the number of single claims/cases and the number of multiple claimant cases. 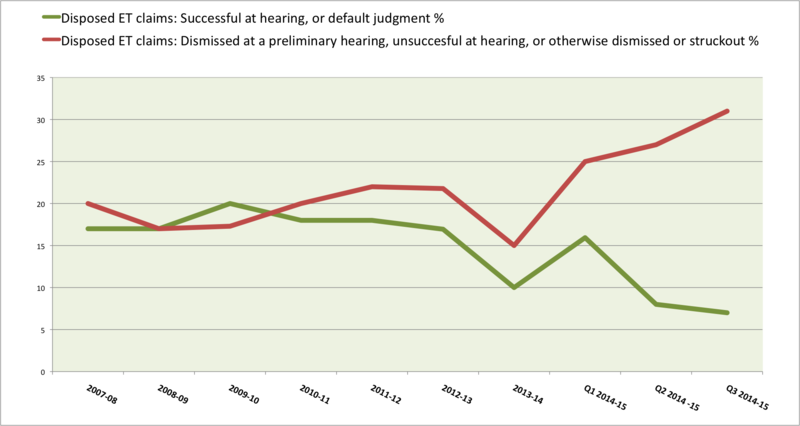 This is the measure that Dr Cable and Giles Wilkes should have focused on in 2011 and 2012, for two simple reasons: (i) it’s a much more meaningful measure of the workload of the ET system (as, in most multiple claimant cases, the tribunal only has to resolve one or two lead claims, even if there are 50,000 claimants in the case); and (ii) it equates to the number of employers affected. And, if that was obvious to me – a lowly policy officer in an under-resourced charity – in late 2011 and early 2012, it should have been obvious to the business secretary, his SpAD, and the then employment relations minister, Ed Davey. This measure of the ‘level of ET claims’ is set out in the following chart, from which we can see that, in 2008-9 and 2009-10, the number of ET cases did rise quite significantly. However, as economists, Dr Cable, Giles Wilkes and Ed Davey would have known that this was entirely to be expected, given a little local (and global) difficulty in the economy from late 2008, and the associated wave of job losses and outright business failures. Indeed, in early 2011 a regulatory impact assessment issued by Dr Cable’s department noted that there had been “a clear rise in [the number of ET claims for unfair dismissal] coinciding with the downturn in the economy and particularly the level of redundancies which peaked in the second quarter of 2009”. We can also see that, in 2010-11 – the first financial year of the Coalition government – the number of ET cases fell by 13 per cent, from 78,700 to 68,500. These figures were published in the autumn of 2011 – several weeks before Dr Cable announced the plan to introduce ET fees on 23 November – but they would have been available to, say, a SpAD in the private office of the business secretary or the BIS employment relations minister several months before that. So, when Dr Cable told that somewhat partisan audience at the EEF in November 2011 that “we are in danger of getting away from the principle that [ETs] should be the last resort, not the first option”, he knew – or should have known – that the level of claims was in fact falling sharply. And, later, he would (or should) have known that this downward trend continued in both 2011-12 and 2012-13, as he and Ken Clarke (later Chris Grayling) finalised the ET fees regime for implementation in July 2013 – by which time the ‘level of claims’ was pretty much back to its lowest level since the turn of the century. In short, Dr Cable and his ministerial colleagues at the Ministry of Injustice could have ‘achieved’ a record low level of ET claims without even going into the office. Now, Giles might well say that, just because the level of claims was falling, it cannot be said that there was nothing wrong with the level of claims. I cannot actually recall Dr Cable, Ed Davey or Norman Lamb making any speeches along the lines of ‘the level of ET claims is falling to a record low, but that is still far too high so we must take radical action to reduce it by another 65 per cent, and sod access to justice’, but hey. Nor can I recall even the maddest of the employer lobby groups suggesting that two-thirds of all ET claims were vexatious. So let’s look at that 2010-11 figure of 68,500 ET cases more closely. Only about two-thirds (i.e. 45,000) of the 68,500 employers affected were private sector businesses, as one-third of all cases (and the vast majority of multiple claimant cases) are brought against public or voluntary sector employers. And there are about 1.2 million private sector employers in the UK. Accordingly, at the time Dr Cable rose to his feet at the EEF in November 2011, the average private sector business employer risked facing an ET claim about once every 27 years. Yet, according to a series of speeches delivered by Dr Cable and other ministers, this marginal risk was enough to keep our valiant entrepreneurial classes awake at night as they fretted over whether to take on another employee. None of which is to say that, in 2011, there was not scope to improve the speed, consistency and efficiency of the ET system (and, to that end, I was later to play a tiny but entirely supportive role in the Underhill review of the ET procedural rules, also announced by Dr Cable in November 2011). But introducing fees of up to £1,200 to bring a claim for unfair dismissal or pregnancy-related discrimination was never itself going to improve the speed, consistency or efficiency of the system. Nor is it to say there was no case for a genuinely fair and reasonable ET fees regime – I argued for such a fees regime in 2012, including in the response of Citizens Advice to the formal consultation on ET fees, and have continued to do so ever since. Was Giles even aware of such alternative proposals for raising the Ministry’s £9-10 million per year? In short, Vince Cable appears, at best, to have consented to Tory ministers’ proposal for hefty claimant fees on the basis of an entirely false premise about the ‘level of ET claims’, and without any evident understanding of the predictable (and predicted) impact of such prohibitive fees on workers’ access to justice. But then why spend time searching out the (informed) views of lowly third sector policy wonks or employment lawyers when you can spend it hanging out in the grand offices of the Institute of Directors and British Chambers of Commerce? Throughout the lifetime of the Coalition, the Liberal Democrat ministers at BIS – Vince Cable, Ed Davey, Norman Lamb, Jo Swinson and Jenny Willott – appeared entirely uninterested in what they might learn from those outside the powerful lobby groups with their vested interests. 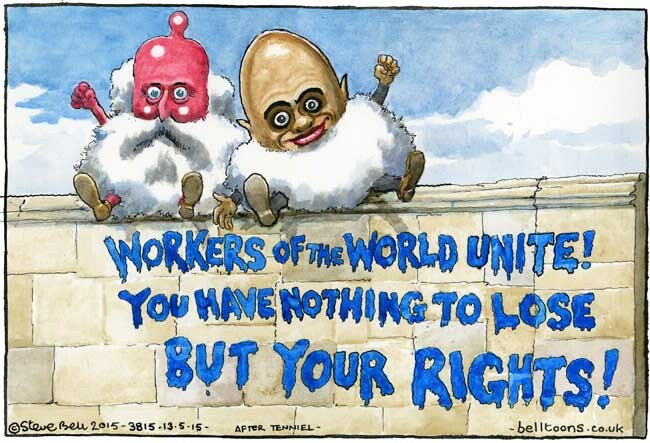 And now, having ignored us, our evidence and our (dire) warnings for five long years, during which they consented (seemingly without much of a fight) to the single most damaging reform ever made to Britain’s system of employment rights – far more destructive than anything proposed by Adrian Beecroft – they blithely assure us we will miss them. When it comes to employment rights, what’s to miss? CBI minions of the world unite, you have nothing to lose but your credibility! If a week was once a long time in politics, it’s now no time at all when it comes to thinking up new legislation. For a week was all it took for renowned Star Trek fan Sajid Javid, newly promoted from culture to business secretary, to master his brief and decide that what Britain really needs right now is another small business and enterprise Bill. Not just any old small business and enterprise Bill, mind, but an “ambitious” small business and enterprise Bill. And this less than two months after the last small business and enterprise Bill – which clearly wasn’t anywhere near ambitious enough – reached the Statute Book. Yes, I made that last bit up. But the Bill really will “cut red tape for business by at least £10 billion over the next five years” and “create a Small Business Conciliation Service to help resolve disputes [especially over late payment]” – these being pledges in the Conservative Party Manifesto 2015. Yes, that’s how evidence-based policy-making works these days. You – the one-week-old cabinet minister – decide to have a Bill, then you hunt around for evidence to justify said Bill. They didn’t tell us this on my MSc in Public Policy, but hey. To be fair to Mr Javid and his colleagues, a Small Business Conciliation Service doesn’t sound such a bad idea. I just wonder whether there will be fees for small businesses to use the Service. And whether those fees will be anywhere near £1,200. That would only be right and proper, after all. Why should hard-working taxpayers have to bear all of the cost? As for how to cut that £10bn of red tape, I imagine Ms Soubry’s inbox is already filling up with lengthy emails from Sir Michael Rake and his numerous minions at the CBI. Because, on Wednesday, while being skewered by Sarah Montague on the BBC Radio 4 Today programme (start at 2:34:55), Sir Michael blustered that we desperately need to cut Red Tape because “where [employment] rights are so extensive it leads to employers not being willing to employ people, that is not helpful to anyone”. And who could argue with that? Later that morning, I tweeted the CBI to ask them which employment rights, exactly, are currently “leading to employers not being willing to employ people”. And also to ask them to explain what it is that causes the “inflexibility in being able to adjust your workforce to changing circumstances quickly enough” that, apparently, so concerns Sir Michael. Needless to say, I didn’t get any response, but it seems reasonable to assume that it’s not the statutory right to four weeks’ paid holiday that Sir Michael has in mind. Could it be the legal right not to be subject to unfair dismissal? Well, I guess it could be. But, if you are an employer, and minded to employ one or more extra members of staff, you will know (unless you are a complete idiot, in which case you probably shouldn’t be an employer) that you have no less than two years to decide whether you’ve made the right decision, before those employees qualify for legal protection against unfair dismissal. That is, you can get rid of them as quickly and as unfairly as you like, as long as you do it within two years of hiring them. And, even if you decide that you made the right decision in hiring them, but circumstances somehow change for the worse after two years, you can still dismiss them (or make them redundant). You just can’t do so without following a fair procedure. And how hard can that be for titans of industry with their gene-based, wealth-creator superbrains? Even if you’re a regular, non-superbrained oik who somehow made it to being CEO of a wealth-creating company, it wouldn’t take you (or your unpaid intern) long to discover that, these days, the risk of facing an employment tribunal claim for unfair dismissal, however badly you treat your human capital units, is … well, negligible. Since the introduction of upfront tribunal fees of £1,200 in July 2013, and the introduction of Acas early conciliation in April 2014, the number of unfair dismissal claims has fallen by two-thirds, to fewer than 13,000 per year. Yep, that’s fewer than 13,000 unfair dismissal claims per year, from a workforce of some 26 million. Put another way, each of the UK’s 1.2 million employers now faces an unfair dismissal claim – maybe well-founded, maybe not – about once every century, on average. But, according to the superbrained, wealth-creating Sir Michael Rake, that is still far too often for our entrepreneurial classes to cope with. So we must cut Red Tape now! Over to you, Sajid. In more than one previous post on this blog, I have included charts showing how – up to the second quarter of 2014-15, at least – the evidence from the Ministry of Injustice’s quarterly tribunal statistics strongly counters the theory, advanced by the former BIS minister Matt Hancock (now at the Cabinet Office) and his friends in the media, that the introduction of hefty ET fees in July 2013 has since deterred only weak or vexatious claims, without deterring well-founded claims. For the charts show that – contrary to what one would expect, were the Hancock Theorem a valid one – the proportion of claims that are ultimately successful has fallen, and the proportion of claims that are ultimately unsuccessful has risen. Somewhat annoyingly, when the Ministry released the tribunal statistics for the third quarter of 2014-15 (i.e. 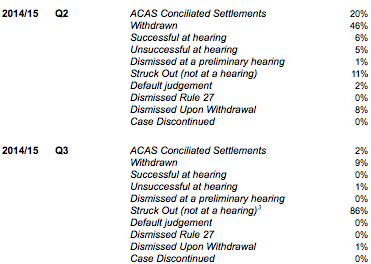 October to December 2014) in March, I was unable to update my charts because the ET outcome figures are given only as percentages, and those percentages were grossly distorted to the point of being meaningless by the settlement (and disposal by being ‘struck out’) during the quarter of one exceptionally large airline multiple claimant case involving some 240,000 jurisdictional claims. On 15 March, therefore, I emailed the Ministry of Injustice to request the base figures from which the Q3 outcome percentages were calculated. And today, after a couple of chasing emails, the Ministry finally replied – without the figures I had requested but with an explanation of how I could calculate them myself by cross-referencing two of the tables in the statistical bulletin. How helpful of them. And so, after many hours sweating over a hot Excel spreadsheet, I have calculated the figures I need to add the third quarter of 2014-15 to my outcome charts. In doing so, I have excluded disposed claims made under the two jurisdictional headings of Working Time and Unauthorised Deductions, because – as well as the 243,606 Working Time claims that were struck out – unusually large numbers of Working Time and Unauthorised Deductions claims were withdrawn, and I assume that many if not most of those jurisdictional claims were also part of the airline case (or a related case). This exclusion might well have introduced a minor distortion of its own, but I can’t see any obvious way around that (though I’m expecting a tweet or email from Michael Reed any time now). Whatever, the tribunal statistics for the fourth quarter of 2014-15 will be published on 11 June, and I’ll update my charts again then. Here are the updated charts. Enjoy. From this chart, we can see that both ‘successful claims’ and ‘unsuccessful claims’ – in the strictest sense – have continued to move in the wrong direction, as far as the Hancock Theorem is concerned. 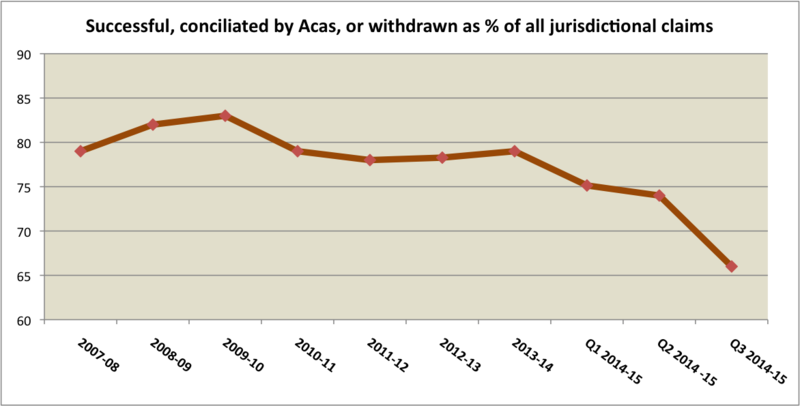 Similarly, the second chart, below, shows that the broader measure of ‘successful’ claims – including those that are conciliated by Acas or withdrawn (in most cases following settlement) – has also continued to fall. Yet, according to the Hancock Theorem, this measure of ‘successful’ claims should by now be nearing 100 per cent – all the weak and vexatious claims having been deterred by fees.